My house is a semi-detached 3 bedroom house within a fairly large estate in the Midlands of the UK. For those of you who are aware of UK estates, the houses tend to be quite close together and overlook each others gardens. I am quite lucky in this regard as although quite narrow, my garden is fairly long and backs on to a field so I only need concern myself with my immediate neighbours. As I really wanted some sort of directional control, the only real option was a beam of some sort. The problem with a traditional 20M Yagi is that it has a turning radius of 8M (26ft) so I would need to be very friendly with my neighbours (something that isn't that likely once I have put up an 16m wide antenna! I looked at various mini-beams but in all of the research that I conducted, I kept coming back to the Hexbeam. There are a number of Hexbeam manufacturers that I found. Most of them use the G3TXQ broadband design. After looking at pretty-much all of them, I finally settled on the "GLOBESPAN" Hexbeam from Dave & Colin (GW3XCR) at http://www.hexbeams.co.uk They were very helpful and patient when I called and asked numerous stupid questions so in a moment of what my family have been calling madness, I placed an order for their 6 band version. I was advised that there was currently a 10 working day delay for this but I thought that this would give me enough time to buy all of the other "necessary" bits-and-pieces that I would need to complete the project. First on my list was a rotator. Here I discovered another minefield (as seems so often to be the case with this hobby that I have chosen). A number of forum posts seem to suggest that due to the light-weight of the Hexbeam, a TV style rotator would be suficient. The ones that I found didn't seem to score very highly on reliability and computer control didn't seem particularly easy to achieve so I kept searching. I finally discovered "SPID Elektronik" and their entry level "Rotor RAU" which is described as suitable for light to medium weight antennas. The fact that the controller comes complete with a USB port sealed if for me. Not the cheapest rotator by any means but SPID seem to get good reviews so I placed the order! As I already had a bracket mounted to the side of my house, I thought that the easiest option would be to simply replace the 1 1/2" pole with a more substantial 2" pole and that would be sufficient. I tried to order a single 6m (20ft) alloy pole from a scaffolding supplier but the cost of delivery was prohibitive (£145) due to the fact that they would need to send their lorry with just my single 6m pole on it. I was advised to buy 2 x 3m poles with a coupler which supposedly is just as strong as a single pole. I also bought new brackets, coax and control cable. Delivery day of my Hexbeam finally arrived and I decided to take the next day off work to try to "get it up". 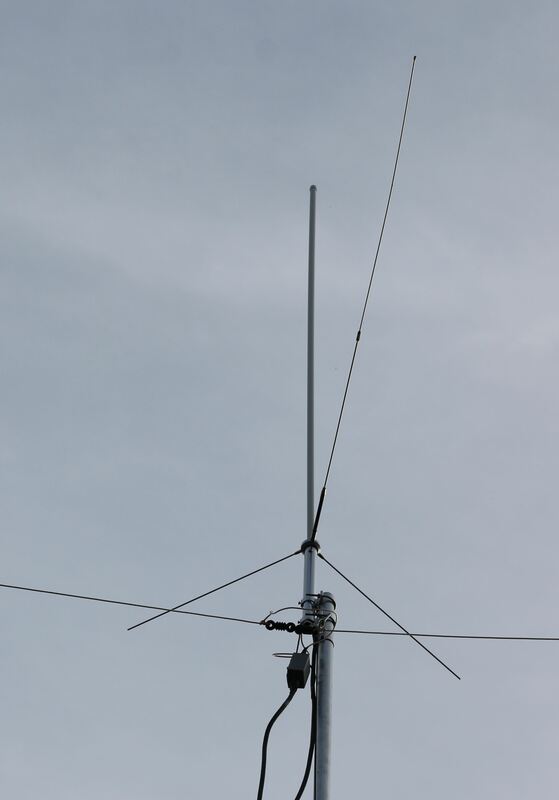 Assembly was very straight-forward and the Hexbeam itself is very well made but once I saw it assembled in my garden, I realised that the Hexbeam, although small for an HF beam, is a very big antenna! Of course I then discovered that I was never going to be able to get the antenna up to my bracket on my own, so I enlisted the help of my brother Wayne (G6NGV) who tried to help me erect the hexbeam on the side of the house. This was the point where we discovered that scaffold pole couplers are NOT as strong as the pole and the pole started to bend at the join. After a number of attempts and trying to hoist the Hexbeam up seperately etc, we decided that it really wasn't going to work and apart from anything else, if we did manage to erect it, I would never be able to get it down again! The next stage in this adventure involved a LOT of research into what options were available. I didn't want a fixed mast/tower as they are the most likely to cause problems with neighbours so I started to look at pump-up masts. Quite early-on I realised that getting a new mast was going to be out of the question so started to look at second-hand ones. There seem to be a large number of Clark Masts SCAM12 available on eBay at the moment (I suspect because the MOD are no longer using them?) so after lots of reading and a few telephone calls. I ordered a second hand SCAM12 mast complete with mounting legs and accessories bag. As the vendor didn't offer shipping, I sent our companies usual courier to collect it and after a false start (they didn't send a big enough van) it arrived a couple of days later. I got the mast home and it was surprisingly easy to assemble (on my own) and I spent sometime reading the instructions and lubricating all of the parts that they recommend lubricating and getting the mast level. I would like to have put the mast nearer the end of the garden (so it is partially concealed by trees) but that is about as near to the end it can get without the Hexbeam being obstructed by the branches of my apple and pear trees. I suppose if I was committed, I would cut down those trees (g) but for now I am stuck with it being in the upper quarter of my lawn. After all of my lubricating and levelling, I also fitted the rotator and made sure that everything was tightend-up correctly. Then came the moment of truth, would I be able to lift the Hexbeam onto the mast on my own? The answer was yes (eventually). It was actually quite easy to do which I suspect was because it wasn't attached to the rotator at the time (which adds about 6.5kg). As it was getting quite dark by this time, I decided to just get everything connected without raising the mast and once it was all wired-up and tested, the first thing I realised compared to my OCF Dipole was how quiet it is. Being used to S3-S5 of noise on 20M, I couldn't hear any noise at all but I could hear quite a few US stations which up until now I haven't been able to in the evening. Updated 4 Dec: I soon realised that the supplied pump was fairly hard work so decided to get a compressor. As mounting the compressor outside was going to be quite a complex proposition, I decided to get a 'silent' compressor and put it inside the house. I finally settled on a "Clarke Shhh 30/9 Air Compressor" which is brilliant. It easily maintains the mast at height without running the pump and when the pump is running, it is little louder than a refrigerator. It feeds the mast via 30m of pipe and allows me to erect the mast by simply turning-on the valve next to the regulator and I have added a pressure release valve that I can pull when I want to lower it. So far I have raised 4 sections of the mast (there are 7 in total) I have also relocated the mast slightly, here is the fully assembled SCAM12 + Hexbeam at just under 30ft together with a video of the rotator in action! I will keep this page updated with anything else relevant to my new beam/mast. nice setup. I'd like to get a Clark mast, HEXBEAM and rotator setup like yours if I can convince the XYL its not too big. Would be interested to know what you laid out on the mast and if you've had any planning issues? I have been very happy with the mast. I paid about £500 including the kitbag and support legs. I have re-greased it a couple of times (always use silicon grease) and find that if I put it up with both my Hexbeam and a 9ele Tonna (2m) on top, my compressor can keep it up all day without needing to run so it doesn't seem to be leaking at all. I have a good relationship with my neighbours and haven't applied for planning permission. The general rule-of-thumb seems to be that planning authorities leave you alone unless somebody complains. You are then invited to apply for retrospective planning permission. Thanks for the info. 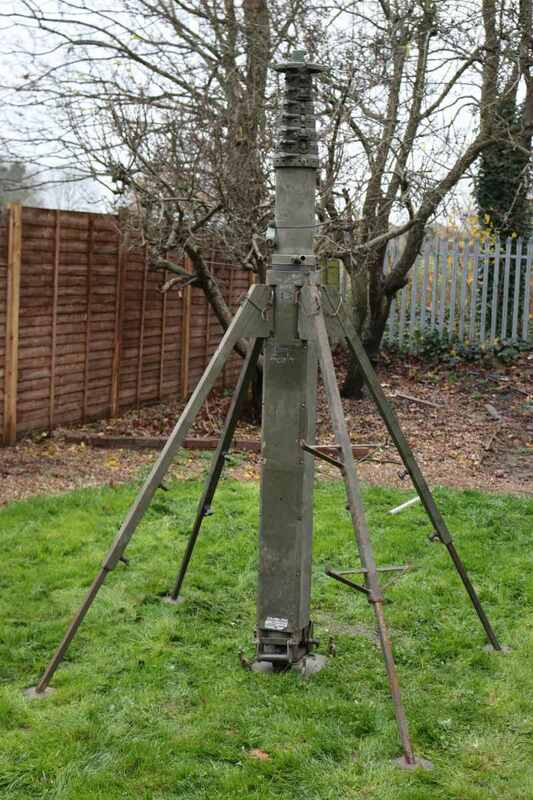 Where did you get the mast (ebay i am guessing). See some suppliers down in Wessex and found another base in Cornwall. Guessing £500 is about right for the mast with all the bits. I will be going to Hamfest so maybe I can strike a deal there if anyone is selling. Yes it was from Ebay. One issue was that the seller didn't offer shipping (collection only). He put it on a palette though and I sent a courier to collect. I can't find the emails at the moment so not sure which seller it was? Have you been to the LRS (Leicester Radio Society) as I remember seeing something on the noticeboard selling Clark SCAM masts which might be worth looking at? Yes. I did my exam there on Saturday and did see the note you mentioned. I might ask about it there then. You were mentioned at the open meeting last night, I gather that you both passed, well done! Hopefully see you there, I usually make it most Mondays.